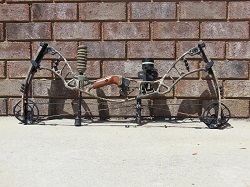 This is a Hoyt Nitrum30 compound bow (Right Hand) Comes with a stabilizer and fiber optic sight. The fiber optic sight is a one pin adjustable from 20 to 80 yards. It also has a fuse drop away rest and a soft green case. Please come in and check all are compound bows and cross bows.